Starting your own private Cellar? 1) Figure out how much room you need for storage (you said 150+ bottles a year, and an average 5 years turn around = 750 bottles) and then TRIPLE IT! You will always need more space than you think. 2) It is the fluctuation of temperature that damages wine. If you do not, or can not have active temperature control, insulate, insulate, and insulate some more. I recommend the mylar/bubble wrap insulation that is becoming more common. It has no nasty glass fibers to worry about, and it gives a good R rating without taking up much volume. 3) Balance – and above all, balance. Make sure that most of your wine when you start is for drinking, not aging, or the first year you will be stealing from your future stocks. Make sure that at least some of the wine in your cellar is for guests. Not just wine for your own tastes. Make sure that some of your wine is always ready to drink. Keep a balance of maturity as well as variety. 4) Your tastes will change. Make sure to leave room for whole new regions and styles of wine. Do not stock too heavily in any one area. See rules 1 and 3. 5) Make sure you have a great deal of flexibility in your racking. Nothing worse than buying a case of magnums, or Champagne, or half bottles; only to find that your racks hold single Bordeaux bottles exclusively. Keep in mind that some wines, esp. Bordeaux is best stored in its original wooden case (auction houses designate when a wine is being offered owc – original wooden case). Make sure you have someplace to put these. 1) Don’t put your wine near a water heater, or other source of heat. This will bake your wines, even if the temperature is constant. 2) Don’t store your wine in cardboard cases. The urge to do this is nearly overwhelming. The cardboard draws moisture out of the air, not critical, but not desired. The cardboard will also fall apart, and you can be sure that it will do so while you are moving a case of your favorite wine, and breakage will occur. Styrofoam shipping containers will be the bane of your existence as you collect. Save them, use them. While they do have cardboard on the outside, the styro inserts will nicely protect your finest wines. 3) Beware of off smells. Greatly over looked in cellar design, off smells can in some cases permeate the corks of your wine, and from there the wine itself. Do not store paint, thinner or other chemicals near your wine. 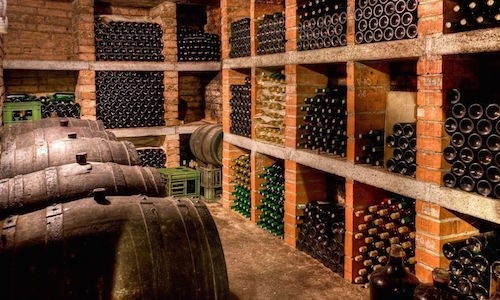 When the rules of wine cellars were being formulated, vibration was not an issue. No heavy trucks, or machinery existed. Now a days it doesn’t take much to find vibration sources, esp. in a frame house. That laundry machine is a likely culprit. While not disastrous, vibration will keep the wine from aging well, as the process of long chain polymerization will be interrupted. 5) Don’t buy cases of wine you haven’t tried first!!! Need I say more?